Yet another independent from the Doncaster area it would be interesting to know just how many there were in the heyday of bus transport. Rossie Motors mainly ran a regular service between Rossington and Doncaster jointly with Doncaster Corporation, Blue Ensign and East Midland must of been a busy route to make it worth while for four operators. The bus above was a thirty foot version of the Daimler CV series hence the 30 suffix code. From what I have come up with, when the 27 ft version of the CVD or G were built to the 30 foot length the code changed to CVD/G6-30 which makes sense. This vehicle is rather rare as the majority of Daimler CVs built around the time this one was were CVGs that is having the Gardner engine. 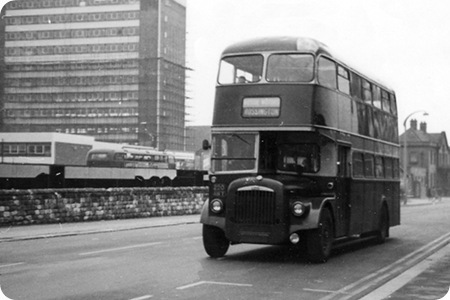 In 1980 this bus transferred to the South Yorkshire PTE (SYPTE) and was numbered 1160 in their fleet. There are also references to the Daimler coding ending with ‘DD’ which I presume stands for double decker, so that would make the above bus a Daimler CVD6-30DD. I worked for Rossie Motors in mid/late 60’s. Loved this bus. Very strong & powerful engine. Good ol’ 220. A fav’ with all the crews at that time. Sadly, it appears to be deteriorating. …..next to a Thurgood Commer, John? According to Bus Lists on the Web, this was the last Daimler engined CV series bus supplied to home operators. Another Doncaster area Independent, Leon of Finningley, took delivery of 432 KAL which had a Roe H41/32F body in July 1961, and this bus was described as CVD650-30DD, which indicates that it was powered by the larger 10.6 litre engine. By inference, this suggests that the Rossie Motors bus, like the few CVDs delivered after the heyday of the Daimler engine finished in the mid 1950s – Swindon (3), Coventry, Glasgow and Potteries (1 each)- had the 8.6 litre CD6 engine. This powerplant was never noted for performance in its naturally aspirated form, so Andy’s comment from personal experience about the "very strong and powerful engine" is interesting. Was this engine turbocharged, or did the bus have the larger CD650 motor? Geoff Hilditch always maintained that Daimler gave up too early on its diesel engine manufacturing, and further development would have yielded dividends. My own experience of the Daimler engine is limited to the turbocharged version fitted to one of the Halifax Daimler CVs, and that bus went up hills like a mountain goat with its posterior on fire, so GGH might well have been right. The PSV Circle Fleet History for Potteries states that Potteries H8900 originally had an ‘exhaust driven turbocharger’ fitted to its Daimler engine. It was fitted with a Leyland 0.600 engine in 1964 – making it unique as a CVL6-30?? It ran in this mode in a quite satisfactory manner, mainly on the 12/13 Hanley to Bentilee services whilst I was at the Company in the late 60s. Except that some crews disliked the inability for conversations between driver and conductor as they could on an Atlantean. Some wanted the glass in the small window between the cab and platform…..whilst others wanted it out!! Oh dear! The suspiciously Dennis Lancet-looking front hub of GWN 432 (next to the Daimler d/d in the flickr photo) caught my eye, and a quick google reveals that it is a Lancet. Wonderful chassis; pity about the styleless body. Is it a replacement? If you go back to the owner’s photostream there’s a detailed history of both vehicles in a caption. Here is a quick link to view it. Yes Ian, the body is apparently a Thurgood replacement as David spotted and it is a Dennis Lancet. Yes, I think it was rebodied in the late fifties. I’m sure there was an article on it in Bus & Coach Preservation Magazine a year or two back. Re Ian’s question regarding the Dennis, I see that the original flikr picture has a full description. Click on the large blue "Photo" word and the picture shrinks. It is a 1950 Dennis Lancet with a 1960 Thurgood body having originally been a half cab built by Yeates. Its always most interesting to read the varied views of those in the know about the features of individual vehicle models. My experience of the Daimler standard engine fitted to the CWD6 and CVD6 examples was most favourable – at Samuel Ledgard’s we had two utilities with Duple bodies, and four heavier Brush models from Exeter, and of course the famous (or notorious) entire class of ten Brush ones from Leeds City Transport – the premature sale of the latter to be operated on the same roads by the independent rival caused a rumpus in the Council Chamber like Guy Fawkes would have loved to launch successfully at Westminster – an immediate resolution was passed that no such embarrassing situation should ever be allowed again !! I also drove several of the former Wallace Arnold coaches rebodied by Roe as double deckers. I always found them to be powerful and fast, and their only disadvantage was that the exhaust manifold was next to the cab and uncomfortably hot in good weather – but there again pleasantly warm in Winter – "you can’t have it all ways" as they say. I’m sure GGH was right about the Daimler engine from an engineering point of view, but commercially there probably wouldn’t have been much point in further development. Interest in Daimler engines all but disappeared around 1950 as soon as Gardner were once again able to satisfy demand. I strongly suspect that Daimler would not have started updating the CD6 and experimenting with turbochargers if it hadn’t been for the secrecy surrounding Gardner’s development of the 6LX at the time the maximum length of double deckers was increased to 30ft. After the 6LX came on stream, the only way Daimler would have sold engines in any numbers would have been to withdraw the Gardner option. That of course is exactly what Albion did immediately after the war (with the exception of special orders) – and look what happened to them! London Transport’s ‘D’ class contained around 10 CWD’s among a sea of CWA’s. They lasted about 4 years and, in this case, it was less to do with being non-standard and more of being more difficult to service, with the timing mechanism being at the rear of the engine. I have a feeling that the exhaust manifold was nearest the driving cab and ‘cooked’ the drivers in hot weather. However, one of these had a chalk notice above the windscreen ‘D?? ?, the fastest ‘D’ of all’! Anyway, with AEC engines coming spare from scrapped STL’s, out they came. The pioneer, at least in Britain, of employing timing gears at the back of the engine was Dennis, who also went a bit further by employing four valves per cylinder. Oil engined Dennis Lancets were very popular with independent operators, who did not have the sophisticated engineering facilities of the larger companies and municipalities, yet the quite complex O4 and O6 engines earned an excellent reputation for quality and reliability. The location of timing gears only became an issue if other aspects of the engine fell short of acceptable reliability standards, when the removal of the entire power unit became necessary for rectification. Daimler, and later Meadows also used rear mounted timing gears, but, in both cases, the quality of design and manufacture failed to achieve the necessary degree of dependability. Albion, like Gardner, used a front mounted timing chain in their 9.0 and 9.9 litre engines, but, unlike Gardner, the chain of the Albion had a propensity to stretch, so that repeated and very difficult adjustment was required to maintain performance. In the early post war period, Sidney Guy sought to compete more strongly with AEC and Leyland by offering the Arab with a larger engine than the 6LW, and he asked Albion if they would supply him with the 9.9 litre EN243. In the event this came to nothing, perhaps because of the Albion’s timing chain shortcomings, though it is possible that merger talks were already under way with Leyland. Guy then turned to the Meadows 10.35 litre 6DC630 (with rear mounted timing gears) which also proved to be a broken reed. Not until the advent of the superb 6LX did the smaller makers have access to a motor of suitable size and quality that was able to take on AEC and Leyland. Gardners also had a right hand exhaust manifold to keep drivers warm! I seem to remember that when Rossie received their first two Fleetlines, this vehicle and the other, the ‘ordinary’ CVG6/30, BYG 890B, were dispatched to Charles H Roe for refurbishing and re-painting. When they came back, they had the nice ROSSIE MOTORS fleetname in gold letters (which they hadn’t had before) to match the Fleetlines. This gave Rossie four very good high capacity double deckers for a service which only required a maximum of two vehicles from each operator! Thanks, Roger and Richard,for the Flickr link. I’d better put cards on the table, head above the parapet etc and confess that I don’t like droopy-swoopy coach bodies, or any kind of "streamlining" for that matter, on traditional halfcab chassis. I feel they work better on underfloors, where the droop at the back is partly balanced by a slightly drooping front, and the Burlingham Seagull got it dead right. (Thanks to Neville M for that fine article.) Curved-waistrail bodies, with their plethora of window and panel shapes and sizes must have been far more expensive to make, repair and carry replacements for. Roger Cox’s words "…rebodying this one to look like a Bedford is the ultimate indignity" perfectly sums up my feelings about that Thurgood body and the attitude of mind that led to its being fitted. Those two recently-posted handsome Alexander Greyhound PS2s (MWA 761 and 761) exemplify to my mind how a halfcab single-decker should look, whether bus or coach. I think everyone is being a bit harsh about the Dennis, possibly because the full story, which appeared in B&CP in September 2009, hasn’t been told here. The point is that by the time it came to be rebodied, it was already no longer a half-cab, but merely a chassis with the remains of a burned-out body sold to a dealer as an insurance write-off. At 10 years old, it is a tribute to the quality of the chassis that anyone wanted to do anything other than scrap it. Rebodying it as a halfcab in 1960 would have been ludicrous, and I’d hazard a guess that getting Thurgood to do the job, rather than a mainstream builder, made enough difference in the cost to make it worthwhile. Very true Peter. I am a VW man and am very sniffy about people hacking (real Type 1) Beetles about. On the other hand, many of these HAVE been saved from the scrap yard and given a second life. That being the case, fine and dandy! I am sure that most of us would agree with Ian that the traditional half cab coach design was a classic in its own right, but Peter’s comments are valid. I believe that something of the order of 900 Lancet III chassis were produced, of which only a modest number survives, and, as with all half cab coaches and buses, many of these were disposed of prematurely with the advent of underfloor engines. That Jenkins of Skewen should have had sufficiently high a regard for this chassis to have it rebodied for further service in the then "modern" age is a testament to Dennis quality. Assuredly, had the operator not done so, this vehicle would almost certainly not be still with us today. In the context of its times, having regard to the dismal contemporary efforts of Duple, Plaxton and others on Bedford and Ford chassis, the Thurgood body is not too bad. Don’t get me wrong! I’m more than grateful that Lancet GWN 432 has been preserved and admire the present owners for the effort they put into its care. 220 AWY is indeed with Isle Coaches at Owston Ferry, along with GWN 432 as part of their heritage fleet. They also have PUJ 783, a Burlington Seagull/Leyland Tiger Cub. GWN 432 is now at Hornsby Motors Ashby and is to be restored for their centenary next year. Just spotted the discussion re Thurgood-bodied Dennis Lancet GWN 432. We ran the story in B&CP, as gratefully acknowledged above, in 2009, when the coach was owned by my good friend, the late Nigel Woodward of Gainsborough. I have extracted the relevant paragraphs and included them below. As Peter Williamson has pointed out, at the time of the rebody, a ‘modern’ body was the only way forward. The work was carried out by Thurgood as it was ‘local’ to Horseshoe Coaches (Modern Super Coaches’ parent), which had bought the chassis, Thurgood having already carried out some rebodying in this style for companies in the Horseshoe Group. The similarity to a Duple Vega results from the inclusion of a number of standard Vega parts in the body, particularly at the rear. Behind the front dash, the original front dash from its half-cab days (below the driver’s windscreen) is still in situ, complete with circular aperture to accommodate the headlamp! East Midlands took over the Rossington Doncaster service from Red Don,think in the very early 1960s. Born and bred in and resident of Rossington from 1940 to 1965 I have many fond memories of Rossie Motors and their dedication to Dainler. From 1951 to 1957 I was, along with other Rossoites, transported by Rossie Motors to Maltby Grammar School a round trip of some 20 miles, usually by a double decker but on rare and welcome occasions by a luxury (to us) single decker coach. I still recall one occasion when overnight snow lay hard packed on the steep road at the entrance to the school. After the passengers alighted the driver was unable to set off as the drive wheels spun on the hard packed snow. The problem was solved by the erstwhile passengers pushing at the back of the bus to get it going, a practice that in the present days health and safety concerns would raise more than a few eyebrows.